If there was an election called now in the UK I honestly do not know who I would vote for, and to be honest I don’t actually believe that it would make any significant difference which party won. The same cannot be said for the US election; I know exactly who I would vote for and I believe that both candidates will have significant and different impacts upon the USA and the world. Barack Obama is the first politician I have ever been impressed by. He has a truly Presidential air and I believe that he is possibly the only candidate who has the chance to make America a great nation again. McCain however seems to be the classic right-wing American WASP we all know and fear. A man who talks always of war and of fighting; is it any wonder that “America is under attack” given the outlook and actions of people like McCain? Then there is Palin. If Obama is the first politician to truly impress me then Palin is the first to truly terrify me. So as we move into election day in America I am both excited and scared. Excited for what I hope will be but scared for what I hope and pray will not. I don’t mean to say that I support McCain: but what has Obama ever really done? He gives a good speech, but I haven’t seen anything of him making choices that are difficult, and important for this country’s future. Yes, he does have a presidential air, but permit me to remind you of Warren Harding: the 29th president. He had a talent for public speaking, but a large portion of what truly got him elected was his appearance, and the ‘air’ of a presidency. In fact, his campaign manager had once said something to the effect of ‘He just looks like a president’. Many of the common people agreed, and by his excellent speeches, elected him president. Well, what happened? He turned out to be one of the worst presidents of the United States history. Obama will do fine, I’m sure (I’m also pretty sure he’ll get elected), but I am always beware of how the appearance and presentation of a candidate can sway your opinion. He gives a good speech, but has he been tested? I guess we’ll find out. The next four years should be interesting. g – I didn’t get a chance to reply yesterday and well we all know how things worked out now. I’ve read about Harding also, but don’t believe that Obama is anything like him. Of course we won’t really know until at least January. I’ve never bought the Republican’s “lack of experience” argument and continue not to. With the plethora of advisers I’m sure a modern President has I wonder how important that really is. 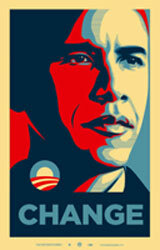 Anyway, I am of course delighted and really look forward to the positive change that I hope he will bring to the USA. I should maybe point out that I am English and live in the UK and now have President envy.